Everyone has a bicycle during their childhood .Sometimes you may also have experienced the theft of your bicycle or someone around you. Do you have a bicycle and you fear of theft, have no fear because the Yerka is here. It’s an idea of 3 young students of Chile University. 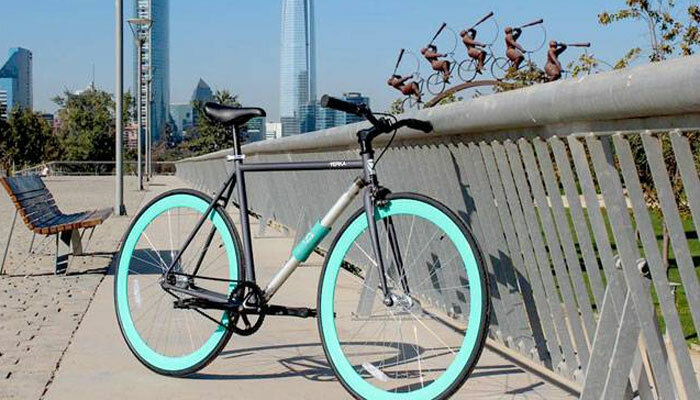 Chile University students Cristobal Cabello, Juan Jose Monsalve, and Andres Roi Eggers, set their minds to creating an unstealable bike, after being the victims of multiple bike thefts at university. The theft of two bikes of one of the inventors pushed the former engineering students from Chile to tackle the exasperating crime. They have named it ‘Yerka’. They named it Yerka because it splits into two parts to lock around a pole. The trio has shared their, made a prototype and now their design went into production with 300 bikes rolling off. They sold around 200 bikes in various colleges in Chile and have now started with the production of the bikes on a large scale, with orders coming in from the Europe, New Zealand ,US, Australia, and Hong Kong. They are seeking $1 million investment from national and international financers. The bike’s lower frame splits in two to allow the seat tube to form a steadfast lock around any tree or pole or bike stand. For a thief to forcibly release it from a rack, one should have to cut through the whole bike itself making it unusable. The tires are attached by a locked bolt so they are safe too. And for the convenience of users, it takes only 10 seconds to lock it. So it’s not only convenient but also saves time during parking it. Aside from the innovative frame design, the bicycle also uses anti-theft wheel nuts which can only be loosened using a special key, a useful method of preventing opportunistic thieves from nicking the wheels.